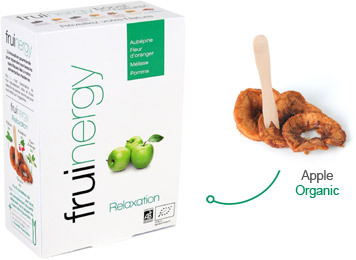 fruinergy Relaxation is the delicious association of apples and plants known for their relaxation benefits, acting in synergy. Hawthorn (Crataegus laevigata) to fight stress. Orange Blossom (Citrus aurantium) to reach an optimum level of relaxation and fall asleep naturally. Lemon Balm (Melissa officinalis) to help with troubled sleep. Rich in magnesium, fruinergy Relaxation contributes to normal psychological and nervous system function. fruinergy Relaxation is made with environmentally friendly techniques. Its carefully selected ingredients add up to a high quality product with authentic taste.